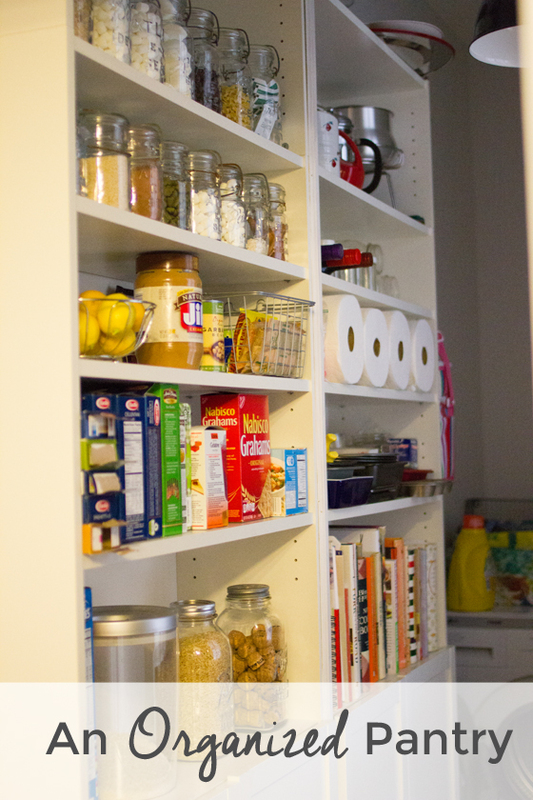 Over the weekend, I decided to finally tackle our pantry organization. I wish I would’ve thought to take a picture before, but basically just imagine a giant mess and that’s what it looked like. It was one of those “oh, I didn’t know we had this!” situations when I started cleaning it out, with things lurking in the back that we’d totally forgotten about. Now, we can see pretty much everything we have right away and know immediately what we’re out of and what’s in stock. Some bulkier boxes that don’t fit into mason jars, like graham crackers and spaghetti noodles, along with canned goods, I organized into one row, so there’s nothing hiding in the back that I can’t see. I’d love to one day get some canisters that fit spaghetti noodles, but for now I just left those in their original boxes. Smaller items like packages of instant oatmeal and taco seasoning packets, I put in a metal wire basket from Target. I love this basket, which was a whopping $3 in the dollar spot. I wish I would’ve bought more before they sold out. I also threw some fruit in an old metal basket I had…. mostly because these tiny little lemons from Trader Joe’s are adorable! On the right side, I used the top shelves to hold a lot of random things that I don’t need to reach often, like extra vases and the fondue pot that we always want to use and never do. Lower down, we have a row of paper towels for easy reach, all our baking pans, and then the bottom shelf holds all our cookbooks. 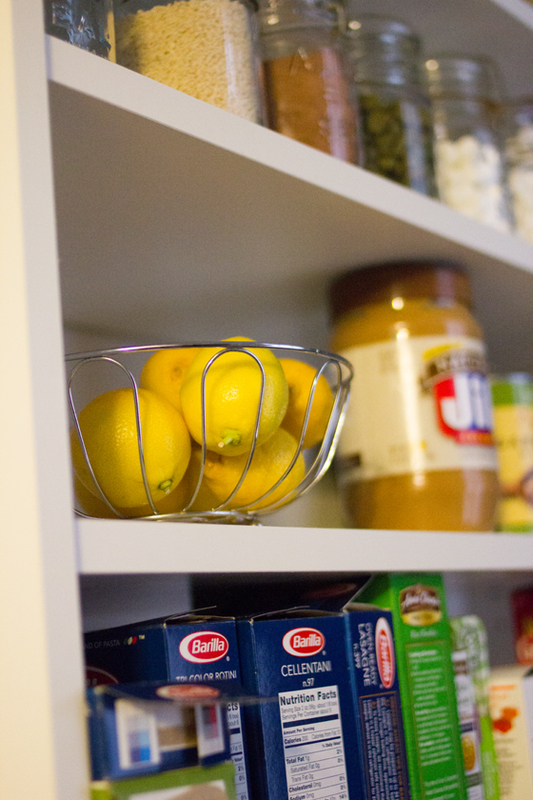 I’m SO happy with our newly organized pantry. 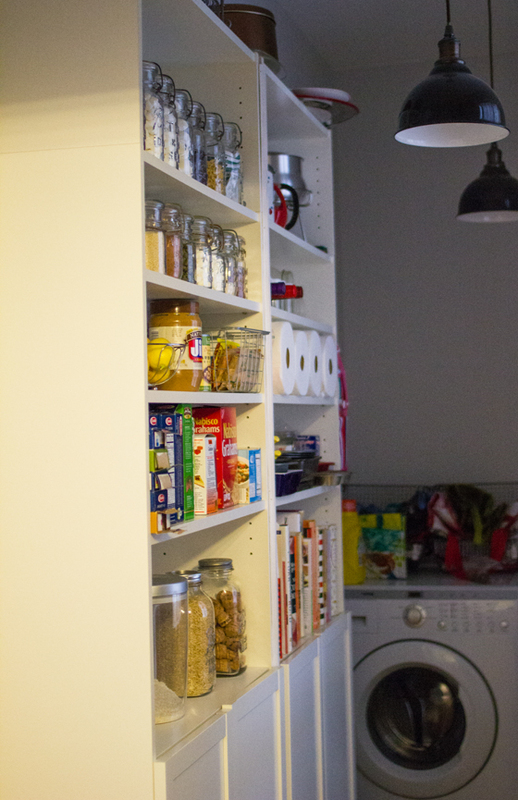 Um, maybe now we’ll get around to actually finishing some other projects in the rest of the pantry/laundry room! Haha wow, you really do have a ton of marshmallows! 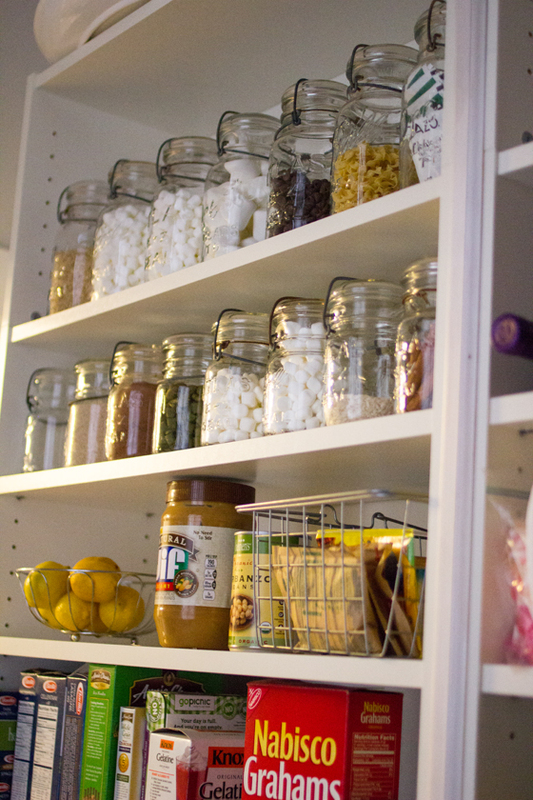 I loove those vintage jars, so jealous right now – we store most of our dry cooking supplies in glass canisters I bought from Ikea, but yours are way cooler. Haha, thank you Liz! So many marshmallows is right! At least now that I can see them all, I can stop buying them thinking I need more (because heaven forbid I run out of marshmallows, HA! ).